They say you should only look at the league table after a dozen games to assess the kind of start your team has made to the season. Perhaps looking at the current table might be a little too much for some North End fans as we sit second bottom after, what has now become, a poor start to the season. Reading were no great shakes and we could have easily have been 4-1 up at half-time but the Royals kept plugging away and deserved their first victory since April. For North End it was a case of not adapting to a different system well enough for the 90 minutes and several players having an afternoon that they will want to forget. Twice we came from behind to level matters but to concede three at home to the team bottom of the league is simply not good by anybody’s standards. Alex Neil decided on going 3-4-3 and to be honest I thought it left the wide men, Earl and Fisher, struggling to find their positions all afternoon. Fisher, in particular, had an afternoon he will want to forget and his body language on the field told a story on its own. It was a slow start but North End had chances through Robinson, Moult and Barkhuizen before the visitors took the lead against the run of play when Baldock fired home after referee Bond ignored a clear foul on Gallagher in the build-up. The goal rocked North End but to their credit the boys fought their way back into the game and when Daniel Johnson fired in off a defender, all looked well again against a very shaky Reading defence. Surely North End would come out in the second half and put the game to bed. PNE did come out strongly and had an appeal for handball turned down and Gallagher having the follow up blocked. Unfortunately it was the visitors who scored next when a short-corner on the left found its way to Swift who put the visitors 2-1 up. North End rang the changes but why Gallagher was taken off is anybody’s guess as he and Robinson looked the only two quality players on the field. North End equalised when Earl had a shot from the left-hand side of the box that Robinson managed to direct over the line right at the back post. Preston went all out for the win but seriously lacked that oomph to overturn Reading and the visitors took all three points when Bacuna scored from a breakaway after Barkhuizen lost the ball and our defence was stretched. No doubt their will be plenty of reasons, mitigations and excuses for this latest reverse including injuries, suspensions, the formation and tactics of the manager and the lack of investment on a proven striker over the summer. In my opinion all four of those issues could be used as a reason for defeat, but I think the side that started was good enough to win the game. Injuries are part and parcel of every team and you should have a big enough squad. Suspensions certainly didn’t help and our players must cut out stupid yellow and red cards. The manager’s tactics might be questioned but Alex Neil has got it right many more times than he has got it wrong over the past 14 months so I think we should cut the gaffer a bit of slack. Finally, sufficient investment in the squad in key positions before the transfer window or loan window closed – well let’s leave that one until the fans’ forum on Monday evening and see what the fans and club have to say. It should be an interesting night. Before the game began I was of the same frame of mind as Judy Garland in the Wizard of Oz in thinking that there would be no place like home and we would at least draw against bottom-of-the-table Reading to maintain our unbeaten home record. However as the game progressed far from being in the comfort of Kansas – or in this case Deepdale – it was more akin to being like Dorothy in the haunted forest. It was not the five-goal thriller the scoreline suggested and the game was littered by defensive errors on both sides. When Callum Robinson, who for me was our man of the match, equalised for a second time I thought we would take something from the match but shortly after, we conceded another soft goal and were left chasing the game again. With Alan Browne and Ben Pearson missing we seemed to miss a bit of zest steel and invention in the middle of the park while the lack of a deadly hitman was also evident as once again we weren’t clinical enough in and around the penalty area finishing off the chances we created. While some may argue we have not had the rub of the green in games played so far, more alarming for me is the amount of goals we are leaking in at the back and if this trend continues we will be lucky not to find ourselves back in League One next season. The Championship is an unforgiving division as Blackburn found out two seasons ago, and is a steep learning curve which our many young talented players will have to adjust to if we find ourselves in a relegation scrap. I feel all is not lost just yet and inexperience can sometimes make players fearless and a couple of victories could up confidence and give us something to build on. However with the next four games being difficult away games at Leeds,Sheffield United and Villa with West Bromwich at home, it is hard to see them coming in the near future. That all too familiar sinking feeling descended on Deepdale this Saturday as the hue of the autumn sunshine hinted at darker days ahead. A touch dramatic perhaps at what is still the early part of the season? Maybe, but for this fan and many others around me it was the lack of spark that really worried me as I reflected back on the 90 minutes just gone. Yes, we created more chances than the visitors and yes, we might feel a tad unlucky about their outcome, like at 0-0 when Tom Barkhuizen’s header came back off the inside of the post with the keeper well beaten, but repeating this week after week wears thin over time. For other mitigating factors I have no doubt that injuries and suspensions to three key players will be trotted out by some as one reason for the result. What makes that hard to swallow is that in those opening minutes of the Barkhuizen chance it was clear that a lack of confidence in the Reading side meant they were there for the taking. Not surprising in a team arriving at Deepdale bottom of the table without a single win to their name, but have no doubt about it, it was the visitors who grew in confidence as they were gifted the opener against the run of play. With North End in possession deep in their own half a poor decision to go for a long throw-in led to them unnecessarily scrapping for 50-50 balls. This led to a foul on Paul Gallagher as he fought for one of those scraps and as all the other home players waited for the referee to blow his whistle the ball was lobbed over the static defence for an easy shot past Declan Rudd. 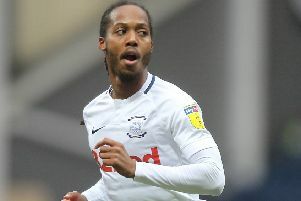 This set the tone for the rest of the game as Preston equalisers were followed up by Reading retaking the lead until the match ran out at the final 3-2 scoreline. With two tough away fixtures over the Pennines in the next seven days I hope we are not seeing a lack of confidence in the manager by some of the players.